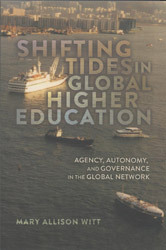 Shifting Tides in Global Higher Education by Mary Allison Witt, Assistant Director of Academic Affairs at the Illinois Board of Higher Education, is volume 9 in the Peter Lang ‘Global Studies in Higher Education’ series. At seven chapters over 130 pages, this volume focuses on the ‘planning process of a multi-institutional program in engineering between institutions in the US and Singapore’. Stanley Ikenberry’s foreword sets the context in relation to how ‘change in higher education is constant and at times transformative’ (p.viiii) and signals: ‘changes in curriculum and in what is judged important and worthy of study; evolution in institutional character and governance; migration and expansion of mission; alteration of the relationship between higher education institutions and the society; and changes in who pays and benefits from higher education’. These are all factors and issues that can be taken up with reference to the contemporary higher education landscape in the UK and the proposals outlined in the Department for Business, Innovation and Skills’ ‘Students at the Heart of the System’ White Paper. In terms of internationalisation, Ikenberry touches on how cultures remain distinctive in collaborations across boundaries, and stresses that with the transformation of the global village, ‘geography and national boundaries’ are ‘less material barriers’. Here Ikenberry seems to foreground a partial account in which questions of equality, access and parity are quiet. In turn, Witt picks up these questions around multiple conceptualisations and interpretations from the outset, and poses an incisive challenge on the extent to which globalisation in higher education can be read deductively from more general theories of globalisation. In chapter one, Witt questions the ‘network’ approach in which connections between nodes are equal by outlining ‘US’ dominance and frames this through the question, how ‘can we apply the ideas of a global network to higher education?’. The remainder of the chapter offers thoughtful nuances, for example, on situating globalisation in terms of local individuals and contexts, and directive sections on the purposes of the research, research questions, significance of the research and plan of the book. In short, Witt presents a rationale and outline for her examination of a PhD program planning in engineering between two research institutions in the US and Singapore and questions of emulation and historical contexts, educational traditions, and cultural milieu’ (8). Chapters two, three and four offer detailed, further discussion and contexts in relation to theoretical interpretations of networks and agency, the context and relevance of Witt’s case study, and the methodological procedures. In Chapter two, ‘Agency and Power within Global Networks’, Witt outlines debates and approaches to globalisation associated with Castells and Appadurai, and draws on Bourdeiu to explore hierarchy and education. On this Witt comments that, ‘the university as a producer of knowledge is deeply embedded in the production of cultural capital’ (p.22). Whilst Witt positions this analysis in relation to global hierarchies and western dominance, there may also be more critical reflections to be drawn in terms of contemporary UK government policy articulations (see Bailey and Freedman, 2011). Following this broad discussion, Witt makes her empirical focus clear (p.25): ‘theoretical concepts do little to illuminate the actual functioning of the global network of higher education or to reveal the nature of connectivity’. This comment sets the scene for the following chapter on ‘Local Context on Global Flows’. Chapter three offers an overview of global patterns of developments of international programs (colonial model; development model; and the market driven model), and offers discussion of emerging rationales and models in international programming. This section helpfully works through how elements of social and cultural development intersect with the stress on global competition and brand management. Chapter three offers instances where, arguably, Witt’s critical engagement, evident in the discussion of debates around globalisation, is limited. An instance of this is how comments on ‘the university serving as the knowledge factories in the knowledge economy (p.38) are left unproblematised. Analysis here might extend to work by Slaughter and Rhoades (2009), Nelson (2010) and Bailey and Freedman (2011). The second half turns to the specifics of Witt’s case study and the historical, political and cultural context of each site. Whilst the focus on Singapore and the US may be of limited application, the questions and framings that Witt employs may be of wider interest and application. This is likewise with chapter four, ‘Methodological Challenges in a Cross-cultural study’, in which Witt addresses research design and setting, methods employed (interviews triangulated with documents) and data analysis. In chapters five, six and seven, Witt presents her analysis and arguments in terms of the building of barriers to a global alliance. The theme of ‘local rationales and global possibilities’ comes through strongly, and the intricacies of program development could readily be of interest to those involved in developing international programs. A range of perspectives and ‘narratives’ are brought into conversation around the themes of program rationale, institutional organizational dynamics, accreditation, brand management, and intellectual property. Chapter seven is perhaps the most helpful for the casually interested reader through presenting an overview of themes and implications, and routes for future research. As Witt suggests, ‘stepping back from the particularities, we can begin to understand this program as part of a larger narrative [that] sheds light on the actual functioning of the global network of higher education’ (p.115). Following a succinct and concisely structured overview of US and Singaporean rationales, Witt moves to potentialities and makes some of the more telling claims of Shifting Tides in Global Higher Education. Firstly, Witt suggests that, ‘this study illustrates that through global network membership, hierarchy and markets are potentially de-emphasized’. The ‘potentially’ part is most telling and reference to a wider range of countries and programs (flagged by Witt in the ‘Considerations for Further Research’) would be welcome in more fully exploring the basis and reach of the claims made from this specific case study. Furthermore, Witt points to the importance of individual social networks (e.g. face-to-face meetings and shared research), and the potential disruption in university-industry-education relations with the possibility for resurgence in ‘science driven by intellectual curiosity’ (p.125). This is a suggestion that, with regard to current agendas and conditions, is particularly interesting (Nelson, 2010). In summary, there could be greater clarity in identifying and addressing the audience and it was difficult to be exact on who would benefit and the wider application for teaching and learning. The specifics of the case studies, which is a strength in terms of analysis, arguably means that the findings and narratives might not readily resonate with those in the field of art, design and media. For those considering and involved in international program development, there are certainly questions, methods and broad findings that would make this an instructive read. Dr Daniel Ashton is Senior Lecturer in Media Communications at Bath Spa University. Bailey, M. and Freedman, D. (2011) The Assault on Universities. Cambridge, Pluto Press. Nelson, C. (2010) No University is an Island: Saving Academic Freedom. New York, New York University Press. Slaughter, S. and Rhoades, G. (2009) Academic Capitalism and the New Economy. Baltimore, The John Hopkins University Press.